Among my earliest memories are the storybooks my mother read me. Both parents, in fact, modelled that books were important and worth spending time on. My mother, who with eight children never kept up with her housework, would leave tasks unfinished in the evenings, and sit and read. While we children might be reading stories, however, she read “Christian” books, that is, of a devotional or theological nature, or if story-based, tales of missionaries or other spiritual stalwarts. Somewhere, perhaps from her example, and from admonitions I must have heard in the wider church community, I gathered that one advanced from “made up” stories to the “real” and more solid meat of books such as those as one progressed into maturity. It had to do with the adult requirement of being useful, I suppose. She forgets, in those moments, that I, her daughter, have not only persisted in reading fiction, I’m involved in writing it. I don’t take it personally, however, for she is among the most affirming of mothers when it comes to the endeavours of her children. Her resistance to fiction, and the subtext her remarks contain about ranking kinds of reading, and even her definitions of “real” or “true,” are what she absorbed in her upbringing and church environment. It fits the earnestness that life in this environment seems to require. The church generally has feared fiction. Perhaps it’s because of the need to “suspend disbelief” to enter the writer’s world. (And who knows but that that world won’t be dangerous?) Perhaps it’s because fiction seems frivolous, distracting, a waste of time, apart from the odd exception like Ben Hur that might deal specifically with religious themes or moral example. One of my favourites is writer Martha Nussbaum’s comment, in conversation with CBC’s Eleanor Wachtel’s, that fiction is important for us because it allow us to imagine the value of other people’s lives. It takes us beyond our own narrow lives, and it takes us beneath the appearances, or outer shape, of others’. It helps us, in other words, toward compassion, toward love. Recently, in “Reading in a Digital Age,” an essay by Sven Birkerts, I got some more nuggets. The essay sets reading the novel into a longer rumination on a “deep shift in the human outlook” because of developments in brain science, and how that relates to electronic technology, and Birkerts’ confession of his own fixation “on the idea that contemplative thought is endangered.” The essay is not, in fact, particularly referencing the opposition posed to novel reading in my introduction. Still, it contributes more reasons to keep at it. The idea of the novel is gaining on me…– that it is a field for thinking, a condensed time-world that is parallel (or adjacent) to ours. That its purpose is less to communicate themes or major recognitions and more to engage the mind, the sensibility, in a process that in its full realization bears upon our living as an ignition to inwardness , which has no larger end, which is the end itself… Deepening. Priming the engines of conjecture. What am I doing when I am reading a novel? How do I justify the activity as something more than a way to pass the time? Have all the novels I’ve read in my life really given me an bankable instruction, beyond a deeper feel for words, the possibilities of syntax, and so on? Have I ever seriously been bettered, or even instructed, by my exposure…?…. I read novels in order to indulge in a concentrated and directed sort of inner activity that is not available in most of my daily transactions. This reading, more than anything else I do, parallels—and thereby tunes up, accentuates—my own inner life, which is ever associative, a shuttling between observation, memory, reflection, emotional recognition, and so forth…. What is the point, the value, of this proxy investment? While I am reading a novel, one that reaches me at a certain level, then the work, the whole of it—pitch, tonality, regard of the world—lives inside me as if inside parenthesis, and it acts on me, maybe in a way analogous to how materials in parenthesis act on the sense of the rest of the sentence. Oh, I like that! The novel lives in me, and acts on me, like materials in parenthesis act on the sense of the rest of the sentence. And then, a final set of nuggets around writing – set in the context of the arts – came to me recently when a friend sent me the link to Donald Miller’s blog where he posted some encouraging thoughts on the value of creating, calling it a kind of solidarity with God. Compassion, contemplation, creativity. Good encouragements all, for what’s true — and useful– about fiction. This entry was posted in Personal, Writing and tagged Donald Miller, fiction, Martha Nussbaum, reading novels, Sven Birkerts by doradueck. Bookmark the permalink. Another excellent read, Dora. I feel fortunate that my mother loved novels, albeit within a narrow range of subjects. And she definitely left the housework go in favor of reading many times. Her writing and speaking, unusual for her time, spurred me onward. I could not help wondering what the relationship, if any, might be between the moral judgments Mennonites make/made about truth v. fiction and the hunger for “reality” that has made the memoir form so popular in the general culture (and among Mennonites also). The “truth” that memoir tells sells better as memoir than as fiction today. Your comment gives me an opportunity — which I’m going to take — to offer a small postscript to the story about my mom’s opinion of fiction. 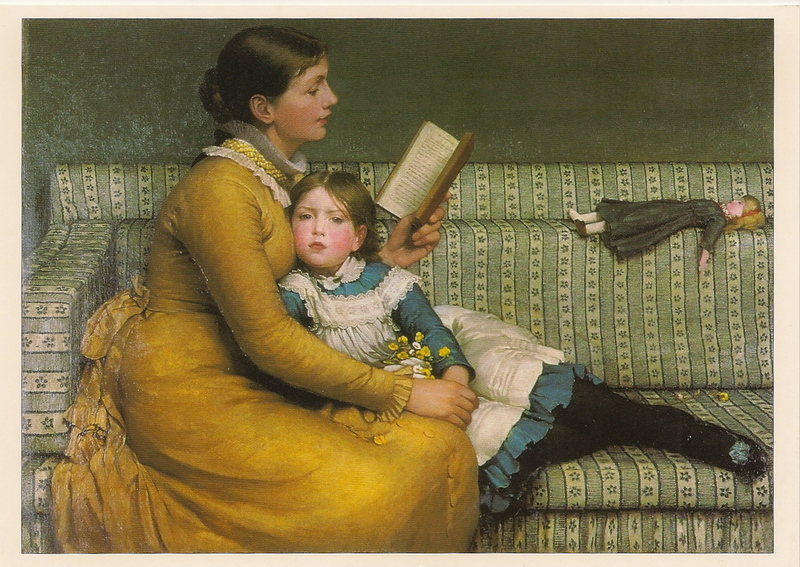 All true, but, of course, in her supportive motherly way, she was eager to read my recent novel. One evening several days later, at an hour later than she is usually up or making calls, she phoned, sounding as excited and young as a teen. She’d stayed up to finish the book because she “just had to know what happens.” This was special for me, not just because it was a personal affirmation, but because — her reserve gone — the fiction had worked its own dependable magic of pulling her in!